Following an 0-2 start in the preseason the Giants came in to the game looking to change the script and set a new tone across the board. The same issues were apparent from the outset as the Giant’s offensive line were unable to efficiently run block or pass protect. The Jets defensive line seemingly got pressure on virtually every snap, controlling the line of scrimmage. The offense was unable to establish the run or allow Eli time in the pocket to find his receivers in the opening quarter. The lack of cohesion on the offensive side of the ball was also an issue of the tight ends inability to block well. With Will Johnson still out with an injury, Larry Donnell, Will Tye and the other tight ends were not able to step up early and be the proficient blockers that they needed to be. Later, Eli Manning’s intended pass to Odell Beckham Jr. was intercepted by Darrelle Revis which led to the Jets taking over on the Giants’ 30 yard line. The Jets quickly got on the board when Ryan Fitzpatrick connected with Eric Decker for a 22 yard touchdown reception. Janoris Jenkins wasn’t able to track the pass and before he knew it, the back shoulder throw was in Decker’s hands. The Giants’ offense generated a paltry 47 total yards in the first half but luckily only faced a 7-0 deficit. The Giants came out in the second half needing to put a strong series together to create some positive momentum for their struggling offense but were not able to move the chains on their first possession. At the nine minute mark, second string quarterback Ryan Nassib, who has struggled through the first two preseason games entered the game. He quickly got to work with a pair of completions to Geremy Davis and Orleans Darkwa. The Darkwa reception was for a first down but Will Tye’s pass interference penalty removed the first down reception. A short time later the Giants turned the ball over on downs. A 55 yard field goal by rookie kicker Ross Martin with just over five minutes remaining in the third quarter extended the Jets lead to 10-0. Through the third quarter the Giants’ offense continued to struggle mightily and it wasn’t clear if they’d be able to turn things around. Following Bobby Rainey‘s strong return with yardage added on for a Jets’ penalty, the Giants took over in Jets’ territory for the first time in the game. Wide receiver Tavarres King was the recipient of Ryan Nassib’s finest throw of the preseason when the Giants took over. Nassib connected with King on a 27 yard touchdown reception that closed the gap to 10-7. As the third quarter was coming to a close, Giants fans finally had something to cheer about. The Giants’ looked to continue their surge in the fourth quarter and another Jets turnover would prove to be the difference. Early in the quarter, a Bryce Petty throw was tipped by linebacker J.T. Thomas and intercepted by defensive end Kerry Wynn who scampered 73 yards for the touchdown. The tide had appeared to turn with the turnover leading to the Giant’s taking a 14-10 lead. Though the momentum would quickly go right back to the Jets, as rookie quarterback Christian Hackenberg, the fourth Jets quarterback to take the field, took control of the offense. Hackenberg went 4-6, driving the ball 79 yards down the field, culminating in a touchdown pass to Robby Anderson. On their next possession the Jets’ special teams put the pressure on as Chandler Worthy‘s 50 yard return gave the Jets great field position. With the Jets starting in the red zone the Giants defense stepped up and held them to a field goal. With just over six minutes to go in the game and facing a 20-14 deficit the Giants attempted to put together a quality possession. The Giants moved downfield but on a fourth and two couldn’t put the ball in the end zone. The third down play was the best chance that the Giants would get but wide receiver Roger Lewis wasn’t able to haul in the very catchable pass for the score. The Jets took over on downs but thanks to a Christian Hackenberg interception snagged by safety Andrew Adams the Giants would get another chance to take the lead. Giants wide receiver Tavarres King added to his already stellar performance with an 11 yard touchdown reception giving the Giants back the lead at 21-20. The Jets’ would get the ball back but fall short of putting together another drive to recapture the lead and fall to the Giants 21-20. 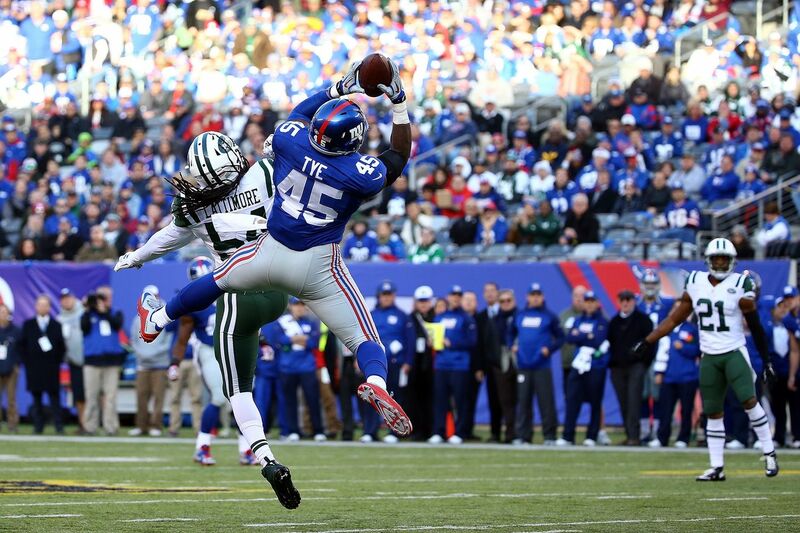 The Giants offense paled in comparison to the Jets on Saturday night. In every facet, the Jets offense was statistically better (313 to 163 total yards, 17-9 in first downs, 8-21 to 1-13 on 3rd down, time of possession 35:08 to 24:52 ) The one area where the Giants were able to take advantage were the turnovers. The Giants forced three turnovers while the Giants only turned the ball over once. That was the difference in the game because the Giants’ two interceptions led to scores and altered the outcome of the game. The Giants have a lot of work to do as they’ll have a short week to prepare for the New England Patriots in their final preseason game. The coaching staff has their first set of cuts to make as the roster gets knocked down to 75 on Tuesday at 4pm. The evaluation period is almost over and those players fighting for roster spots are running out of time to prove themselves. The picture is starting to get clearer as the regular season is just two weeks away.